#JaneUnChained LIVE as world famous primatologist Jane Goodall of the Jane Goodall Institute urges people to stop eating meat! This on her 85th birthday! She cited herself as an example of the energy you can have on a plant-based diet. This woman put chimpanzees on the map, demanding they be treated as the highly evolved, complex beings they are! Jane jumpstarted animal rights in the 1960’s! 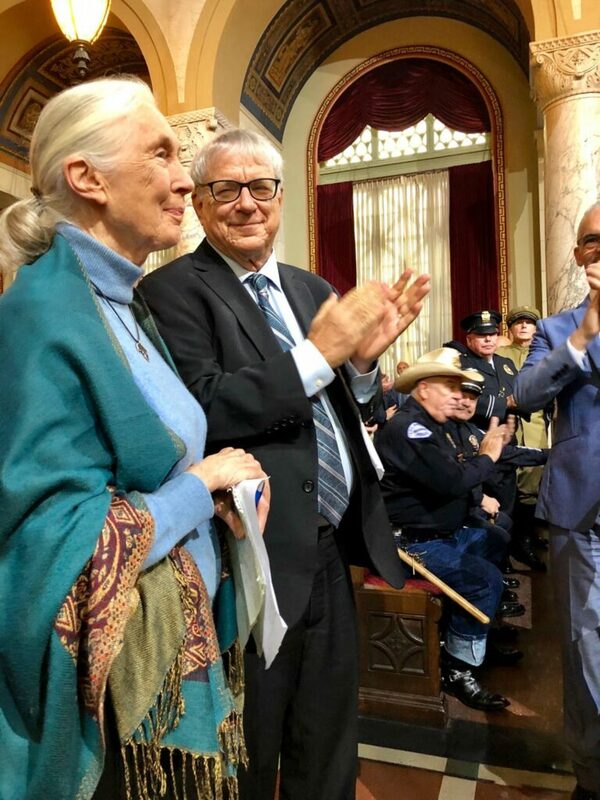 Today, the Los Angeles City Council, and LA Mayor Eric Garcetti, honored Dr Goodall. Steven M. Wise, head of the Nonhuman Rights Project, also spoke! 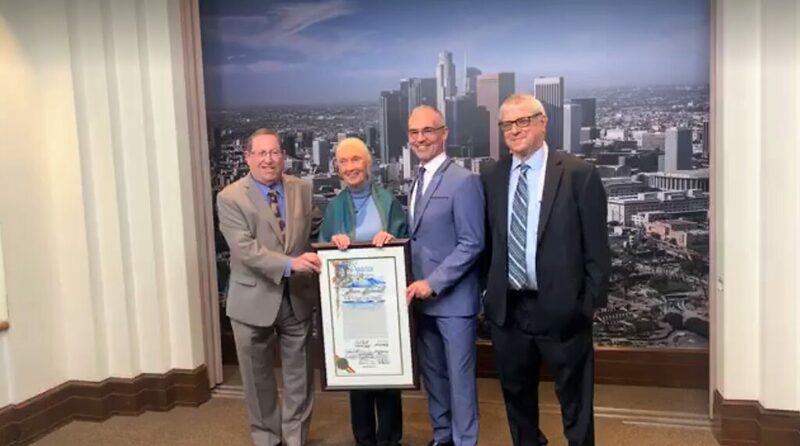 Jane Goodall receiving her award alongside Councilmen Paul Koretz, Councilmen Mitch O’Farrell, and Steven Wise of NHRP. 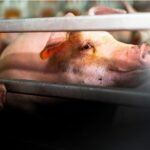 Jane Goodall points out that factory farmed animals, who are forced to live in nightmarish conditions, have emotions. While they are capable of feeling happiness, they know only fear and despair inside CAFOs, Concentrated Animal Feeding Operations. Dr. Goodall also explains that the animal agricultural industry is destroying the environment by razing forests, which sequester carbon, to create cropland to feed the more than 50 billion farm animals being fattened up for slaughter at any given time. It’s highly inefficient because animals eat far more than they produce as meat or dairy. Most people don’t realize that most soy produced is fed to factory farmed animals, not to hungry children. Dr. Goodall emphasizes the need to examine our daily decisions and make ethical choices. She has eaten a plant-based diet since 1969! She recommends a meatless diet to protect animals, habitats, and one’s own health. Dani Rukin and Jane Velez-Mitchell LIVE for JaneUnChained News. 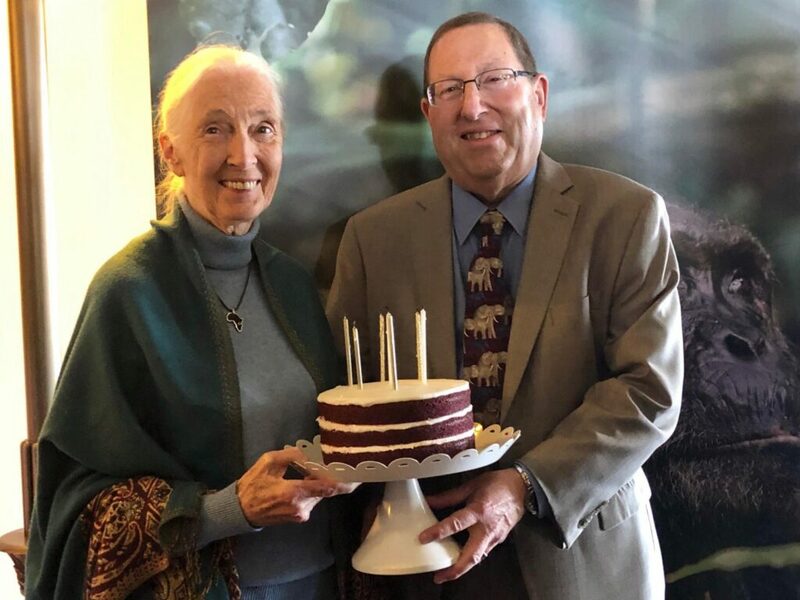 This event celebrated Jane Goodall’s birthday and the launch of the Generation Jane Campaign. Councilmen Paul Koretz gives us an overview of the incredible work done by this legendary woman. Dr. Goodall’s research, documented on film, showcased the complex societal structures of chimpanzees. She has inspired so many girls to become scientists and conduct research for animals, not on them. Councilmen Mitch O’Farrell also shares a wonderful story: his touching encounter with a baby chimpanzee. LA Mayor Eric Garcetti is also on hand to praise Jane Goodall. Watch their unique encounter as Jane pretends the Mayor is a chimp! Jane explains that we have a duty to protect our environment, not only for wildlife, but for the future of our children. Jane Goodall is a legend! Her ultimate message is to urge us to honor the similarities we have with other beings on this planet and respect all sentient life. Steven Wise applauds Jane Goodall for all that she has done to further research for animals. Los Angeles Commissioner for Animal Services, Roger Wolfson, explains how the Nonhuman Rights Project (NHRP) is fighting for personhood for animals. Kevin Schneider, who works with NHRP, explains that it’s crucial to give animals legal protections and legal rights. He explains how society currently treats nonhuman animals as things and property, not individual beings. Dr. Goodall’s work has furthered their fight to shine a light on the sentience of all beings. 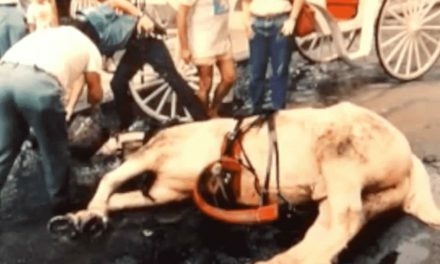 Steven Wise, the founder of NHRP, explains how NHRP’s work parallels the civil rights movement. They “fight one fight at a time and one courtroom at a time,” says Steven Wise. They focus on chimpanzees, elephants, and orcas, but they believe that all species are deserving of these protections. Jane Goodall explains her admiration for the Nonhuman Rights Project. Dr. Goodall says, when she started working with chimpanzees in the 1960’s, her research was not well-received by the scientific community. She faced sexism. She had not yet received her scientific degrees. She was told the animals should not have been given names, just numbers. She was mocked as overly emotional. Her methods were attacked as heresy. Today, we know so much more about animal intelligence thanks to her pioneering work. Those cold, arrogant “scientists” underestimated both Jane and the chimps she studied. Jane’s respectful and loving attitude towards other species proved to be the right course, scientifically and ethically. Hopefully, one day, thanks to the work of Jane Goodall and the NHRP, society will evolve to the point where respect for nonhuman animals is the norm and personhood for animals is the law. Happy 85th Birthday Jane Goodall! Your legacy will live on forever! Visit the Jane Goodall Institute website! Photos courtesy of Dani Rukin and Jane Velez-Mitchell. PreviousGearing Up for Real Change At This New Events Center! NextDon’t Look At This If You’re Hungry! 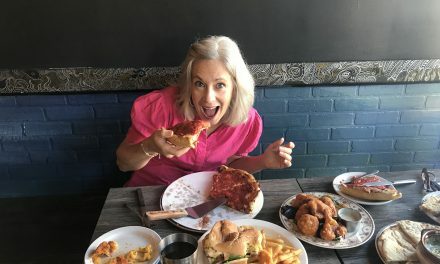 Dive into Vegan Deep Dish Pizza in Chicago! 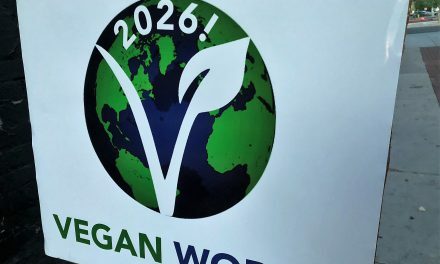 Getting Together to Save The World by 2026! Puerto Rico's "Catman" in Action!